Bus from Penang to Alor Setar is the most convenient option to travel from Penang to Alor Setar. Because there is no train available in Penang Island, passengers need to go to Butterworth for train boarding before heading to Alor Setar. 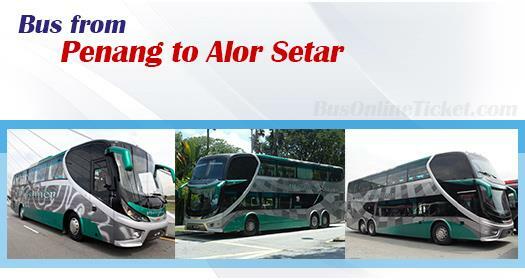 Therefore, taking bus from Penang to Alor Setar saves passengers from hassle. The bus fare for bus from Penang to Alor Setar is selling at very affordable level of RM 12.90, provided by Plusliner, the largest and most reputable bus operator in Malaysia. Their coaches run daily 8:30am, 1:30pm and 6:30pm from Penang to Alor Setar. Duration for bus from Penang to Alor Setar usually takes about 1.5 to 2 hours, depending on traffic condition, especially the traffic at the Penang Bridge. The bus is a direct service from Penang to Alor Setar. Washroom break is provided upon request. Please note that Plusliner coaches are leaving from Penang Sungai Nibong bus terminal. There is no more departure from Komtar Prangin Mall after the government authority moving all coach departures to Sungai Nibong bus Terminal. Sungai Nibong bus terminal is 15 to 20 minutes driving distance away from Georgetown. Passengers without car could take bus service 401 to Sungai Nibong bus terminal from city bus station at Prangin Mall, Komtar, Georgetown. Due to limited bus schedule daily from Penang to Alor Setar, by Plusliner only, passengers are advised to book Penang to Alor Setar bus ticket online at BusOnlineTicket.com to avoid disappointment. This hassle-free online booking Penang to Alor Setar bus ticket, by BusOnlineTicket.com, provides instant booking confirmation to passengers. Passengers just need to print out the email confirmation voucher to check in at bus counter to exchange for boarding pass.